Sagrada Familia Barcelona is a huge Roman Catholic church which is designed by Antoni Gaudi. This unfinished temple is a part of UNESCO World Heritage Site and was consecrated by the Pope Benedict XVI in the year 2010. This temple attracts visitors from all around the world. The history behind the construction of the Sagrada Familia has been so long that it only makes the visitors more curious to learn about it. Here is a brief understanding of the history behind the Basílica i Temple Expiatori. The beginning– The start of the Expiatory Temple of the Holy Family, begin in the year 1886. Josep Maria Bocabella i Verdaguer discovered the spiritual association of devotees of Saint Joseph. The first stone was set up on 19th March 1882 at St. Joseph’s Day in a lovely ceremony hosted by the Josep Urquinaona, Bishop of Barcelona. Gaudi– Gaudi took over the construction in the year 1883 and the work on crypt was continued and finished in the year 1889. Then, he began construction of apse. 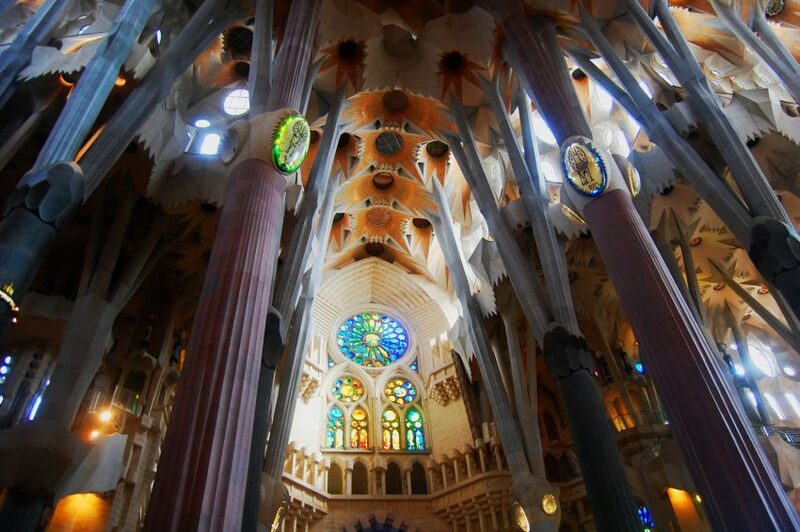 Once a great amount of donation was received, Gaudi suggested a grander design. He proposed to avoid the old Neo-gothic plan and rather suggested to make the construction more innovative and monumental. 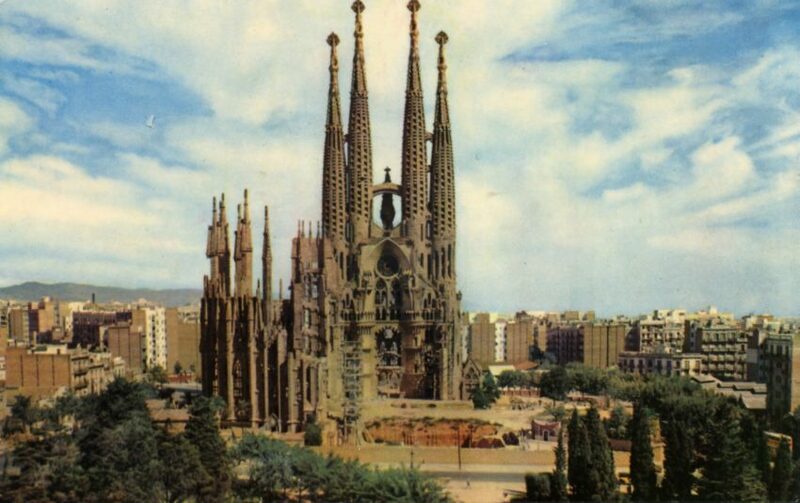 The design proposed by Gaudi involved a huge church with Latin cross and mounting towers. His plan was to make the church symbolic in terms of both sculptures as well as architecture. The foundation of Nativity façade was started in the year 1892. The construction of apse façade was finished in the year 1894 and the Rosary portal, the entrance to the cloister was finished in the year 1899. In the year 1909, Gaudi started building the Sagrada Familia provisional school buildings for the children on the south-west corner. A model of Nativity façade was showcased in the Paris exhibition. In 1925, the first bell tower was finished which was, unfortunately, the only tower Guadi saw finished. He died the next year and was buried in the Chapel of Our Lady of Mount Carmel in Sagrada Familia’s crypt. In all his working years, he collaborated with many architects, sculptors, modelers etc. After the death of Gaudi, Domenec Sugranes took over the project and worked until 1936. In 1936, during the time Spanish Civil War, the revolutionaries, put fire to the cry which resulted in the destruction of the provisional school. The workshop was also buried and all the plans and photographs were destroyed. After the Spanish Civil War incident, many architects worked on the building and the construction slowly continued. In the year 1955, the first fund-raising drive was organized to collect money for the construction. This initiative became very successful and ever since then the fundraiser was organized every year and took the construction of the Sagrada Familia to speed. On 19th March 1958, on Saint Joseph’s day, several statues made by Jaume Busquets of the holy family was set up. Later in 1968, Josep Maria Subirachs was put in charge of creating the sculptures and statues to put on the passion façade. The transepts and vaulting in the central nave were completed and the construction of the Glory Façade began. The same year a mass was organized in the temple which showed the magnificence of the whole site. In the year 2001, the Passion façade’s main window was completed by Joan Vila-Grau who installed stainless glasses representing the resurrection. The crossing columns were also completed in the same year. In the year 2002, Gaudi and his great work were celebrated with the city council of Barcelona hosting International Gaudi Year to celebrate his 150th birth anniversary. The expiatory temple of Sagrada Familia came up with a different initiative that included relocation, restoration and starting the Sagrada Familia schools building. In the same year, the wall of the patriarch and prophets was completed by Josep Maria which was planned by Gaudi to be set up on the Passion façade’s top porch. In the year 2005, he completed the sculpture that represented Ascension between the towers of the Passion façade. The same yea,r the windows were installed in the central nave and a Japanese sculptor Etsuro Sotoo completed the Eucharistic symbols of bread. In the year 2006, the choir present in the Glory Façade was completed completely on the planned model by Gaudi. The ambulatory’s vaulting surrounding apse was later completed in the year 2008. The vaulting which is present around the apse and crossing was completely finished in the year 2010. 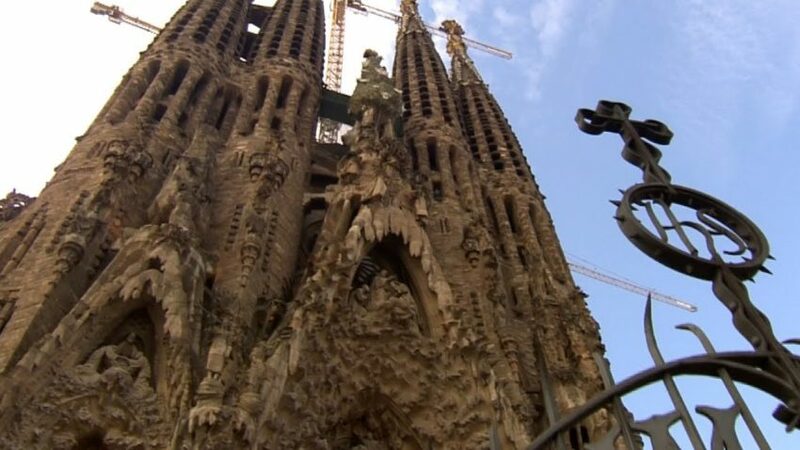 The year 2010 is seen as a milestone year for the Sagrada Familia’s history. Because in this year the temple was blessed as a worship place by His Holiness Pope Benedict XVI. Upper narthex on the Passion Façade: the upper narthex of the passion façade otherwise known as cyma is almost finished. The work is ongoing regarding the presentation of the garden where Jesus Christ was buried and the quarry. Western sacristy: It was blessed in the year 2015 and it is completed now. People enter the sacristy from the Basilica through the Liturgical Path. From 2016 mid, people have been entering the cloister to get a close look. The Basilica’s interior: The choirs have been completed with benches of stones and the wrought-iron railing that features musical hymn notes that plays throughout the year. Since December 2015, the stainless-glass windows of the upper side have been in the display and also the Nativity staircase has been in the display since July 2016. The stained-glass windows that are installed in the staircase of the apse on the Passion façade are perfectly in place since December 2016. The staircase of the apse completes the windows that are inside the Basilica apart from the Glory façade. Towers of evangelists – There are four towers that stand at the height of 76 meters. The goal is to take the height to 135 meters by the year 2020. Tower of Virgin Mary – The tower is currently growing up from the apse. The middle of the tower will be at 135 meters and the tip will be raised at 140 meters. Tower of Jesus Christ – The tower of Jesus Christ will be the tallest of all the towers with the height of 172.5 meters. In the construction of Sagrada Familia Barcelona interior Gaudi, some great combination of lights are used to enhance the grandeur of the architecture. The sun rays falling on the pinnacles of the windows and towers. The growing sun brightens up the Nativity façade’s portals. The chemistry of lights and shadow when the sun is setting gives the façade a whole dramatic character. During the day, the Glory facade gets the sun shine on the 16 lanterns placed on the monumental porch and brightens the Basilica’s entrance. Gaudi believed that colors express different phases of life and this is the reason why he put so much emphasis on the Church of the Holy Family. 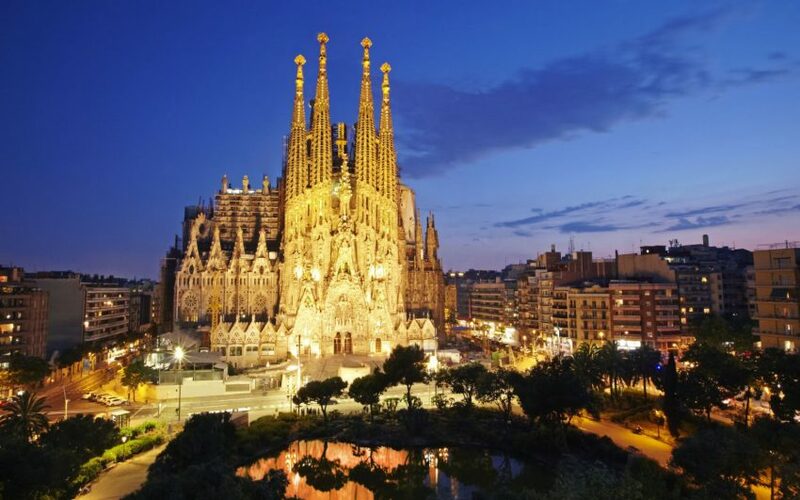 Basilica and Expiatory Church of the Holy Family is an absolute sight to take in and its history makes it even more interesting. However, the church is not the only place that will catch your attention here or the only place to explore. 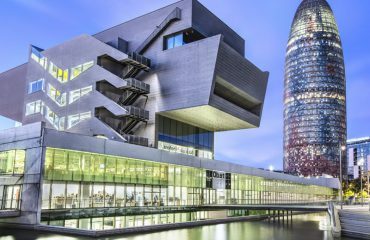 Barcelona is filled with beautiful and interesting sites to explore. Every nook and corner of this town have something beautiful to offer. 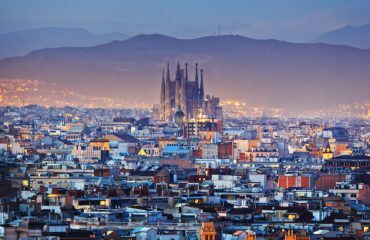 So when you visit Sagrada Familia Barcelona, here are some other places close to it that you would definitely want to explore. Sant Pau Art Nouveau Site: After the restoration of more than 5 years, the Sant Paul has become one of the greatest Sagrada Familia architecture that shows the cultural vibe of the place. It is also home to headquarters of around 9 international bodies, working and researching in the field of health and education. Take a tour of Sant Paul’s new building that is currently influencing the modern architecture. Local Food: If you are in Barcelona then you must take a break from your tour and devour the local cuisine. And if you plan to do so, Gaudi Avenue is one of the best places to indulge in some of the best punches and tapas in the city. If you have got some nice weather then go and sit in some open place and enjoy the mouth-watering local cuisines while taking the beautiful view of the city. The Michael Collins Irish Bar: The Michael Collins Irish Bar may not be considered as famous as the Gaudi’s work; however, the spot is one of the favorite pubs in the city. Plus, it is also one of the most popular neighborhoods of Church. The pub has got different varieties of beer, a relaxed environment, and great customer service. Of course, the Irish music is something that one cannot ignore. Gaudi’s Avenue: Gaudi’s Avenue begins in front of the unfinished Gaudi’s church and the avenues see its end at one of the best architecture L’Hospital de le Santa Creu i Sant Pau. If you visit Sagrada Familia, your trip is incomplete if you didn’t take a stroll in this avenue which is filled with great cafes and restaurants. 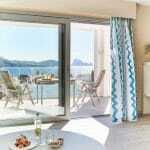 The walk here will allow you to enjoy the great view of the city and don’t forget to try the tapas from the local shops. You can also shop for some trendy clothes from the local shops here. Visit Passeig de Gracia: Gracia before 19 century used to be a different town from Barcelona and Psseing de Gracia was a street that linked the two towns. Today this street is filled with trendy shops, cafes. If you are in Barcelona then you must visit Passeig de Gracia mainly because it is close to Casa Batllo or it is the place where you can tour La Pedrera. However, one of the simplest and probably the greatest reasons to visit Passeig de Gracia is because of the lively vibe and the ethnicity of the place. Just take the purple line (L2) from Sagrada Familia. However, if you have the time then try taking a walk to reach there and explore the city. Vesping: Driving around leisurely is one of the best ways to explore Barcelona. You can hire a Vespa and head out on an excursion. Generally, the place from where you hire the Vespa explains how you can explore the city better and help you improve the experience. If you are close to Church of the Holy Family, you can easily hire Vespa as you will find the rental agency near it. Passeig de Sant Joan: This is an amazing avenue located in the center of the city which is very close to Sagrada Familia. 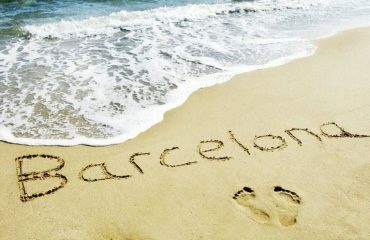 And it is one of the must-see places if you are in Barcelona. Passeig de Sant Joan begins at the Arc de Triomf which is a memorial arch constructed by architect Josep Vilaseca i Casanova and it comes to an end in one of the popular neighborhoods of Travessera de Gracia. Bakery Puiggros: The bakery is situated at the Gaudi Avenue’s end which is only 5 minutes away from Sagrada Familia. The bakery is nothing short of a historic shop which has a variety of pastries, bread, coffees, and teas to offer. 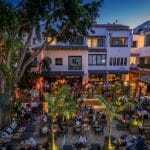 It was established in the year 1922 and recently renovated. Bakery Puiggros is the best place to explore if you are there with your kid as the place also have a kid’s area with lots of space to play around with lots of toys. If you visit Sagrada Familia make sure you also stop at Bakery Puiggros to taste the best homemade pastries in Barcelona. Barcelona is undoubtedly a beautiful place with a beautiful culture. May be this is the reason why this city is so popular among the travellers. This historical monument adds to the ethnicity of the place and the rich history of this unfinished church makes it even intriguing. If you find yourself in Barcelona make sure you definitely visit Sagrada Familia.